I have just realised that I have not managed to get a photo of 105 since 2007, not sure how its managed to stay that elusive! 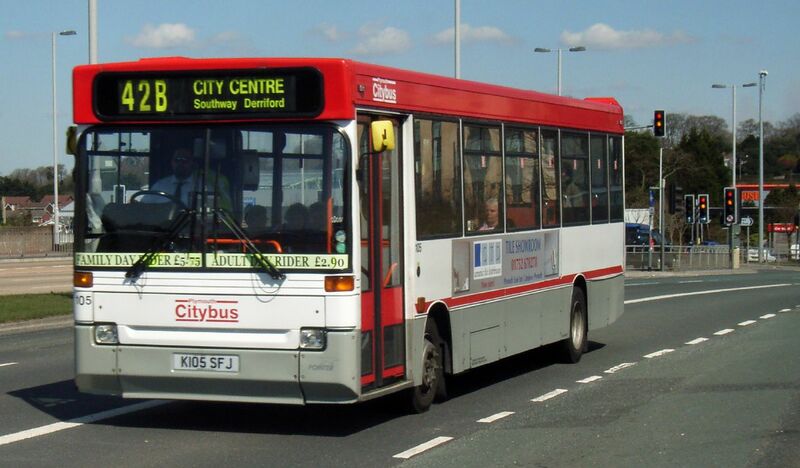 That is all about to change though as 105 has entered the growing collection of the Plymouth City Transport Preservation Group. One of the PCTPG youngest members along with Chairman Ralph Deldridge struck a deal to buy Plaxton Pointer bodied Dennis Dart 105 K105 SFJ from Plymouth City Bus (Go-Ahead Group) and add her to the pool of preserved buses within the PCTPG. This is the first Dennis Dart ex Plymouth to be added to preservation and she will be ready to appear at the Hoe rally today for the official addition to the group. She is one of the oldest Darts left though similar 107 is still in active service in the new livery the rest are out of use and 101/2 have been sold. Thanks for that - I had forgotten that one. Just shows I should have checked my own records first! I know it had been withdrawn as accident damaged.